The aim of this project was to develop a interactive visualization toolkit to support protocol-based care. Based on the Software Prototype CareVis, this project is an approach to communicate the complex logic of Asbruplans to domain experts like physicians or nursing staff. Asbru can be used to express clinical protocols as skeletal plans that can be instantiated for every patient. Since a plan is modeled in XML, this representation is not well suited for physicians. To illustrate an Asbruplan, it is necessary to display different types of data: logical sequences, time-oriented data, flexible execution order, non-uniform element types and state characteristics of conditions. AsbruFlow meets this requirements providing multiple views and using visualization methods well-known to domain experts. The tightly coupled views are based on the concepts of clinical algorithm maps and LifeLines. This project was developed under Eclipse 3.4.0 with JDK 1.6, Prefuse beta (release 2007.10.20) toolkit and the TimeVis API developed by Peter Weishapl. Adding/Removing Facets dynamically in the Temporal View. Overview+Detail mode: a small window containing a down-scaled, simplified tree overview where the current position within the plan is highlighted. This small overview window can be toggled on or off. Fisheye View mode: distorts elements that are out of the current focus geometrically by shrinking and moving. Collapsed Facets: Collapsing facets leads to vertically shrunk and semantically zoomed representations. 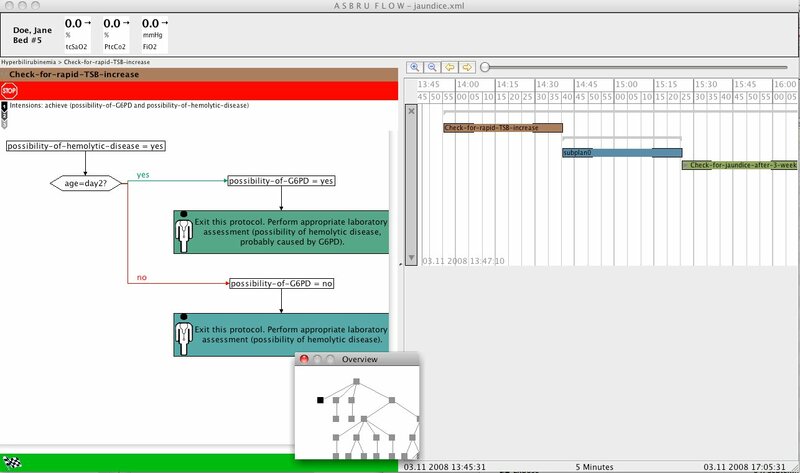 AsbruFlow application window showing a Jaundice plan. 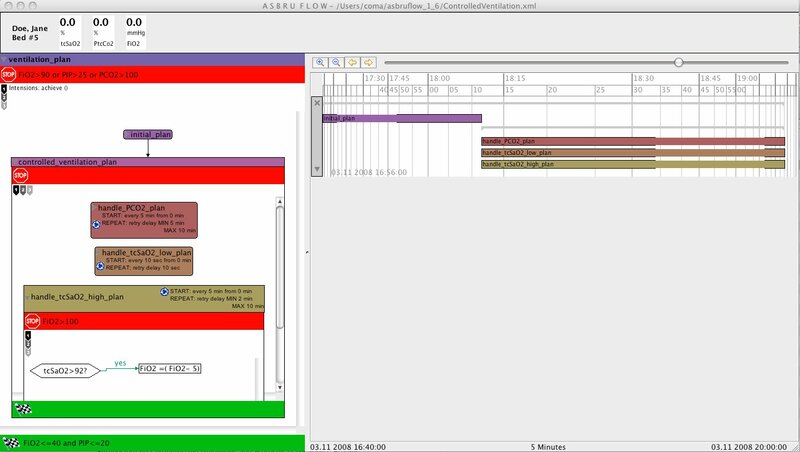 AsbruFlow application window showing a ControlledVentilation plan.